The Pizza Files: The Binge Part 13. Painting, oh how I hate painting. So I played the friends and family card. How do you repay friends and family for helping with home maintenance? Why pizza of course. 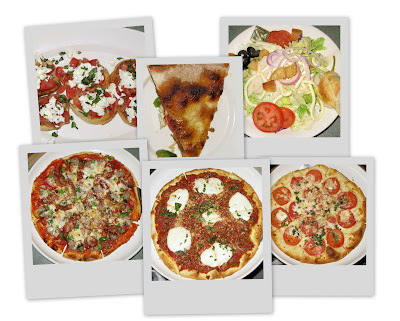 That's how Caito's Sicilian Restaurant & Pizzeria became part 13 of the Pizza Files 2009 Summer Binge. Today's menu started with, Bruschetta and Caito's House Salad with the House creamy Italian dressing. For pizza it was three, including the Caitos Special with pepperoni, sausage, mushroom, bacon, green pepper, mozzarella, provolone and romano cheese. Next was the Velozzi Margherita with virgin olive oil, tomatoes, fresh mozzarella, fontina, romano and fresh basil. Last was the Spinjuine with mozzarella, provolone, a special spicy tomato meat sauce prepared with sausage, choice ground steak, sauteed onion, fresh basil and fresh mozzarella. The last pizza is my favorite, but you will have to wait for the full story. The Binge Part 14, unplanned bonus. The Binge Part 12, unplanned bonus. The Binge Part 11, unplanned bonus. The Binge Part 10, Road Trip Bonus. The Binge Part 9, Road Trip Bonus.